Treadwell’s GratEX® FRP grating is a high strength, single piece construction frp mesh panel product. 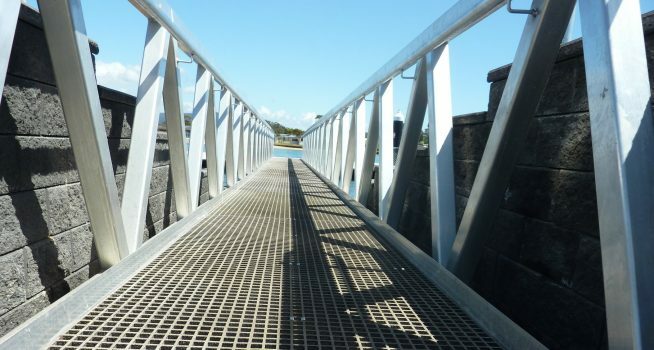 Treadwell's FRP grating is composed of glass fibres which are finely placed in a matrix. They not only weigh lighter than most other materials but are also more economically viable. They are strong and are composed of less brittle and heavily composed materials. Treadwell offers both standard panel sizes as well as the option of custom panels made to order from your drawings, or alternatively, drawings provided by Treadwell’s professional drafting department. We serve to bring to you the best quality FRP gratings that will maximise benefits for whatever the purpose. Light weight GratEX® panels allow for eﬀective on-site fabrication/trimming whilst ensuring that wastage is minimised. Load bearing bars in both directions allow for use without continuous side support and so contribute to cost eﬀectiveness. GratEX® oﬀers all the benefits available with grating made from other materials plus a host of advantages over steel or other traditional alternatives. Because of its advantages and flexibility, FRP has become the optimal choice in a multitude of applications over a wide scope of industries.